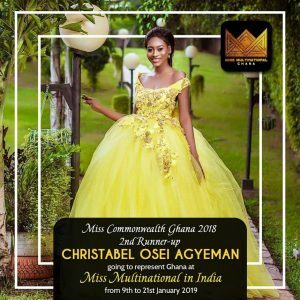 Christabel Osei-Agyeman(Bella Agyeman) is a Ghanaian born,25 years of age and a model. She has completed the her tertiary level education at the Ghana Institute of Languages. She has soared higher and higher through hard work and the passion for what she loves. She loves singing, site seeing and watching movies. 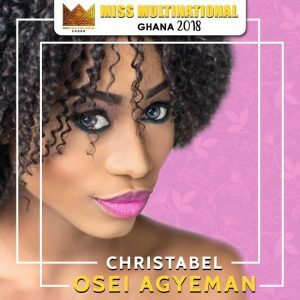 after the commonwealth pageant in which she was the 2nd runner up she did not stop there, she kept on pushing hard and now she has earned Miss Multinational Ghana and now she gets to travel to india to represent ghana at miss multination the pagent which will be contested by over 100 queens from different parts of the world the pagent is slatted to take place from january 9th to 21ist in india. She is working hard to eradicate poverty and hunger and also put smiles of the faces of children all over the world.